Small Intestine Meridian / Channel Acupuncture Points. This meridian contains 19 acupoints in one side, that is 38 acupoints in total. Location: On the ulnar side of the little finger, about 0.1 cun from the corner of the nail. Indications: Headache, febrile diseases, loss of consciousness, insufficient lactation, sore throat, redness of the eye, cloudiness of the cornea. 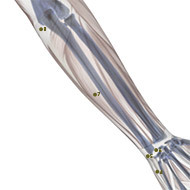 Acupuncture Method: Puncture subcutaneously 0.1 inch, or prick the point to cause bleeding. Moxibustion is applicable. Vasculature: The arterial and venous network formed by the palmar digital proprial artery and vein and the dorsal digital artery and vein. 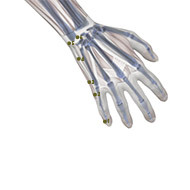 Innervation: The palmar digital proprial nerve and the dorsal digital nerve derived from the ulnar nerve. Location: When a loose fist is made, the point is on the ulnar end of the crease in front of the metacarpo- phalangeal joint of the little finger, at the junction of the red and white skin. Indications: Numbness of the fingers, febrile diseases, tinnitus, headache, reddish urine. Regional anatomy Vasculature: The dorsal digital artery and vein arising from the ulnar artery and vein. 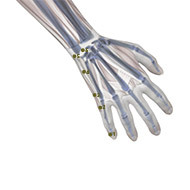 Innervation: The dorsal digital nerve and palmar digital propria 1 nerve derived from the ulnar nerve. 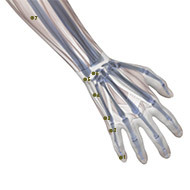 Location: When a loose fist is made, the point is on the ulnar end of the distal palmar crease, proximal to the fifth metacarpophalangeal joint, at the end of the transverse crease and the junction of the red and white skin. Indications: Pain and rigidity of the neck, tinnitus, deafness, sore throat, mania, malaria, acute lumbar sprain, night sweating, febrile diseases, contracture and numbness of the fingers, pain in the shoulder and elbow. Vasculature: The dorsal digital artery and vein, the dorsal venous network of the hand. 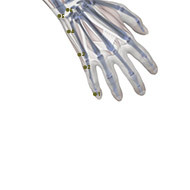 Innervation: The dorsal branch derived from the ulnar nerve. Location: On the ulnar side of the palm, in the depression between the base of the fifth metacarpal bone and the hamate bone. Indications: Febrile diseases with anhidrosis, headache, rigidity of the neck, contracture of the fingers, pain in the wrist, jaundice. Vasculature: The posterior carpal artery (the branch of the ulnar artery), the dorsal venous network of the hand. 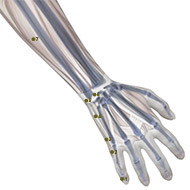 Innervation: The dorsal branch of the ulnar nerve. Indications: Swelling of the neck and submandibular region, pain of the hand and wrist, febrile diseases. Vasculature: The posterior carpal artery. Location: Dorsal to the head of the ulna. When the palm face the chest, the point is in the bony cleft on the radial side of the styloid process of the ulna. Indications: Blurring of vision, pain in the shoulder, elbow and arm. Vasculature: The terminal branches of the posterior interosseous artery and vein, the dorsal venous network of the wrist. Innervation: The anastomotic branches of the posterior antebrachial cutaneous nerve and the dorsal branch of the ulnar nerve. Location: On the line joining Yanggu (SI-5) and Xiaohai (SI-8), 5 cun proximal to the dorsal crease of the wrist. Indications: Neck rigidity, headache, dizziness, spasmodic pain in the elbow and fingers, febrile diseases, mania. Acupuncture Method: Puncture perpendicularly 0.5-0.8 inch. Moxibustion is applicable. Vasculature: The terminal branches of the posterior interosseous artery and vein. Innervation: Superficially, the branch of the medial antebrachial cutaneous nerve; deeper, on the radial side, the posterior interosseous nerve. 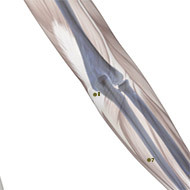 Location: When the elbow is flexed, the point is located in the depression between the olecranon of the ulna and the medial epicondyle of the humerus. Indications: Headache, swelling of the cheek, pain in the nape, shoulder, arm and elbow, epilepsy. Vasculature: The superior and inferior ulnar collateral arteries and veins, the ulnar recurrent artery and vein. 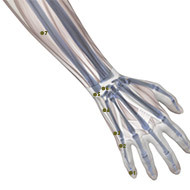 Innervation: The branches of the medial antebrachial cutaneous nerve, the ulnar nerve. 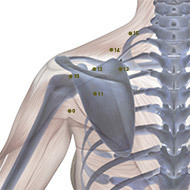 Location: Posterior and inferior to the shoulder joint. When the arm is adducted, the point is 1 cun above the posterior end of the axillary fold. 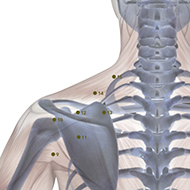 Indications: Pain in the scapular region, motor impairment of the hand and arm. Vasculature: The circumflex scapular artery and vein. Innervation: The branch of the axillary nerve; deeper in the superior aspect, the radial nerve. 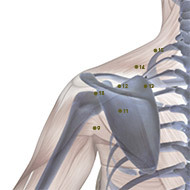 Location: When the arm is adducted, the point is directly above the posterior end of the axillary fold, in the depression inferior to the scapular spine. Vasculature: The posterior circumflex humeral artery and vein; deeper, the suprascapular artery and vein. Innervation: The posterior cutaneous nerve of the arm, the axillary nerve; deeper, the suprascapular nerve. Location: On the scapula, in the depression of the center of the subscapular fossa, and at the level of the 4th thoracic vertebra. Indications: Pain in the scapular region, pain in the lateroposterior aspect of the elbow and arm, asthma. Acupuncture Method: Puncture perpendicularly or obliquely 0.5-1.0 inch. Moxibustion is applicable. Regional anatomy Vasculature: The muscular branches of the circumflex scapular artery and vein. Location: In the centre of the suprascapular fossa, directly above Tianzong (SI-11). 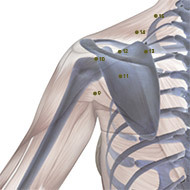 When the arm is lifted, the point is at the site of the depression. Indications: Pain in the scapular region, numbness and aching of the upper extremities, motor impairment of the shoulder and arm. Acupuncture Method: Puncture perpendicularly 0.5-0.7 inch. Moxibustion is applicable. Regional anatomy Vasculature: The suprascapular artery and vein. Innervation: The lateral suprascapular nerve and accessory nerve; deeper, the suprascapular nerve. 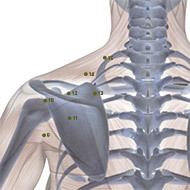 Location: On the medial extremity of the suprascapular fossa, about midway between Naoshu (SI-10) and the spinous process of the 2nd thoracic vertebra. 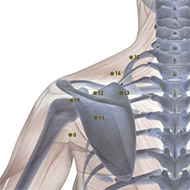 Indications: Pain and stiffness of the scapular region. Regional anatomy Vasculature: Superficially, the descending branches of the transverse cervical artery and vein; deeper, the muscular branch of the suprascapular artery and vem. Innervation: Superficially, the lateral branch of the posterior ramus of the second thoracic nerve, the accessory nerve; deeper, the muscular branch of the suprascapular nerve. Location: 3 cun lateral to the lower border of the spinous process of the 1st thoracic vertebra where Taodao (GV-13) is located. 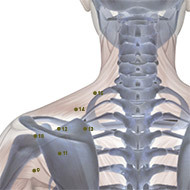 Indications: Aching of the shoulder and back, pain and rigidity of the neck. Acupuncture Method: Puncture obliquely 0.3-0.7 inch. Moxibustion is applicable. Vasculature: Deeper, the transverse cervical artery and vein. Innervation: Superficially, the medial cutaneous branches of the posterior rami of the first and second thoracic nerves, the accessory nerve; deeper, the dorsal scapular nerve. 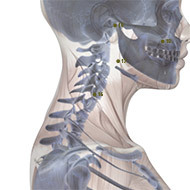 Location: 2 cun lateral to the lower border of the spinous process of the seventh cervical vertebra (Dazhui, GV-14). Indications: Cough, asthma, pain in the shoulder and back, hemoptysis. Acupuncture Method: Puncture obliquely 0.3-0.6 inch. Moxibustion is applicable. Regional anatomy: See lianwaishu (SI-14). 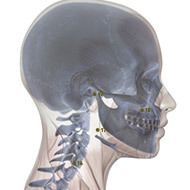 Location: In the lateral aspect of the neck, posterior to m. sternocleidomastoideus and Futu (LI-18), on the level of the laryngeal protuberance. Indications: Sore throat, sudden loss of voice, deafness, tinnitus, stiffness and pain of the neck. Acupuncture Method: Puncture perpendicularly 0.3-0.7 inch. Moxibustion is applicable. Vasculature: The ascending cervical artery. Innervation: The cutaneous cervical nerve, the emerging portion of the great auricular nerve. 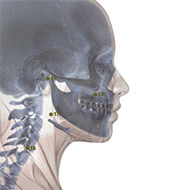 Location: Posterior to the angle of mandible, in the depression on the anterior border of m. sternocleidomastoideus. Indications: Deafness, tinnitus, sore throat, swelling of the cheek, foreign body sensation in the throat, goiter. Vasculature: Anteriorly, the external jugular vein; deeper, the internal carotid artery and internal jugular vein. Innervation: Superficially, the anterior branch of the great auricular nerve, the cervical branch of the facial nerve; deeper, the superior cervical ganglion of the sympathetic trunk. Indications: Facial paralysis, twitching of eyelids, pain in the face, toothache, swelling of the cheek, yellowish sclera. Acupuncture Method: Puncture perpendicularly 0.5-0.8 inch. Vasculature: The branches of the transverse facial artery and vein. Innervation: The facial and infraorbital nerves. 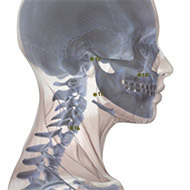 Indications: Deafness, tinnitus, otorrhea, motor impairment of the mandibular joint, toothache. Acupuncture Method: Puncture perpendicularly 0.5-1.0 inch when the mouth is open. Moxibustion is applicable. Innervation: The branch of the facial nerve, the auriculotemporal nerve. This meridian originates from the ulnar side of the tip of the little finger (Shaoze, SI-1). Running along the dorsum of the hand and the posterior border of the lateral aspect of the upper arm and passing the elbow, it reaches the shoulder joint region. Then, it circles around the scapular region, where it converges over the shoulder (Dazhui, GV-14), and then turns downward to the supraclavicular fossa (Quepen, ST-12). Further, it runs deeper inside the chest cavity to link with the heart. From there, it descends along the esophagus, passes through the diaphragm, reaches the stomach, and finally enters the small intestine to which it pertains.